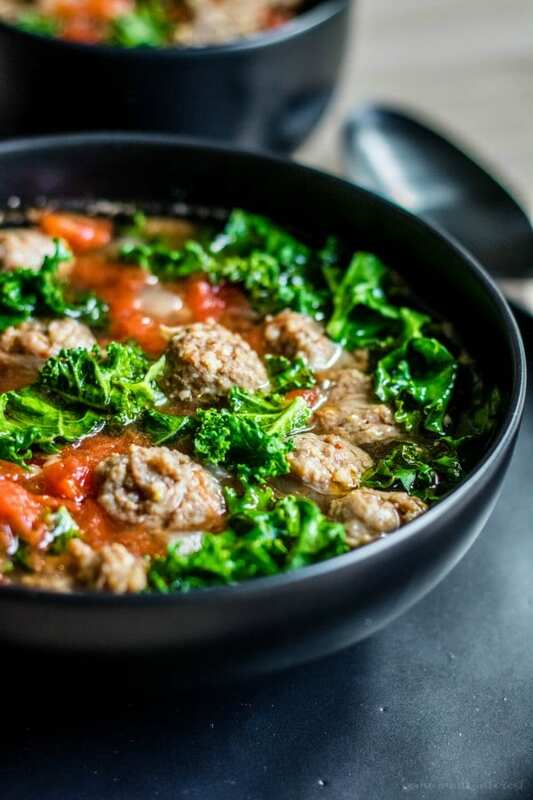 Low Carb Instant Pot Sausage and Kale Soup - Home. Made. Interest. 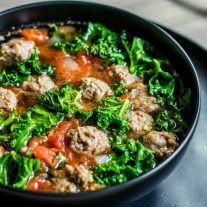 Low Carb Instant Pot Sausage and Kale Soup is an easy 5 ingredient low carb Instant Pot soup recipe that can be made in less than 30 minutes! This Low Carb Instant Pot Sausage and Kale Soup has been my go-to lunch all week as I have been struggling to get back to eating low carb after the holidays. It is one of my favorite pressure cooker soup recipes. 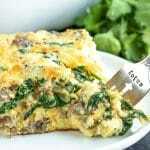 It only has 5 simple ingredients but it’s packed full of flavor thanks to the Italian sausage and diced tomatoes. Not only is this low carb soup easy to make it is also quick! The great thing about cooking your sop in an Instant Pot is that you can throw all of the ingredients together, set the pressure to high and in 15 minutes you have soup that tastes like it was simmered for hours. 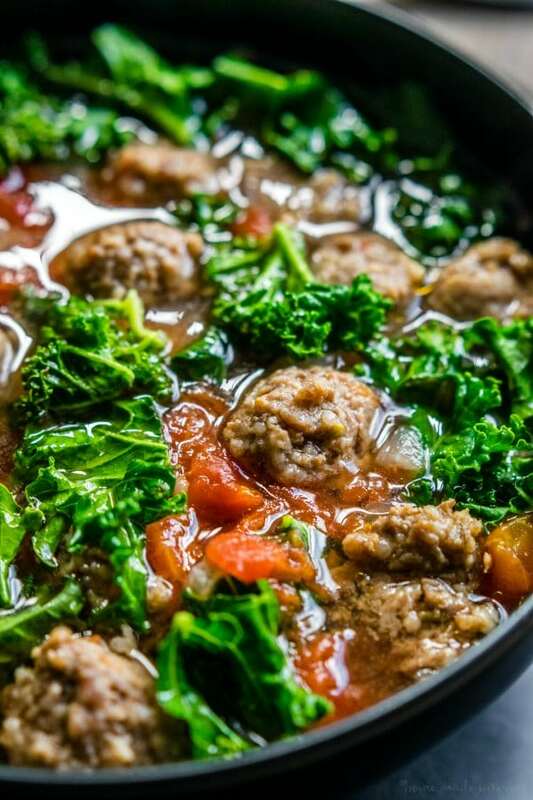 I do brown the Italian sausage for my Low Carb Instant Pot Sausage and Kale Soup before pouring in the diced tomatoes, and broth. I think it gives the Italian sausage even more flavor but it certainly isn’t necessary if you’re in a hurry. 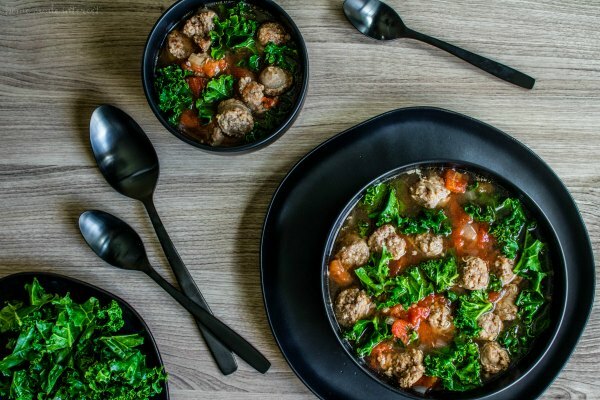 There are two options for cooking the kale in this low carb soup. You can add the kale into the Instant Pot and let it cook with the rest of the ingredients in the pressure cooker. This gives you a delicious soup and cooks the kale perfectly but it does lose its vibrant green coloring. I prefer to chop up my kale and place it in a microwave safe dish with a little water to steam it in the microwave right before the soup is ready. Then I add the steamed kale to the cooked soup. It has a beautiful color and a great texture. Both ways taste amazing so it really comes down to whether or not you have time for that extra step. Instant Pot or other pressure cooker – Speed up the cooking process without sacrificing the flavor by using a pressure cooker to make your soup. Microwave Vegetable Steamer – You dont have to use this but I sure do love mine. It makes steaming vegetables in the microwave so easy! Set Instant Pot to saute normal or low and brown the sausage. Turn Instant Pot off and add onions, diced tomatoes, and chicken broth to the pot. Fasten the lid on your Instant Pot or pressure cooker and close the steam valve. Set to manual, pressure, high for 15 minutes. While the soup cooks place the chopped kale in a microwave safe dish with about 1/2 a cup of water and then cover and cook in the microwave for 3-4 minutes or until the kale is tender but still bright green. Remove, drain water, and set aside. After the time is up let the pressure cooker sit for about 10 minutes and then release the rest of the steam by opening the valve carefully. Open the lid to your pressure cooker and add kale before serving. NOTE: If you do not want to steam your kale separately you can place it in the pressure cooker/Instant Pot along with the other ingredients and cook them all together at the same time. This tastes just as good the kale just won't have the vibrant green color. I made this today and it was very simple and very good! I did add the kale into the IP and it was just fine. My husband loves Italian flavoring and so he enjoyed it also! I’m so glad to hear you liked it! This was my go to lunch this winter. Is the sausage Raw or cooked? You brown the raw sausage and then cook with the pressure cooker setting. Should I use ground sausage or links? Thanks! Delicious! I used Italian sausage with romano &. Brocolli rab. Threw in a bit of Italian spice & 8 oz of baby kale.